The writing is a masterclass in ‘show not tell’, with the third-person narrative never straying from Nella’s viewpoint, and revealing each passing thought, feeling and fear that flits through the girl. It’s a delight to read, drawing you into a world set abroad in space, time and outlook, yet swiftly as familiar as your own home thanks to Burton’s skilful handling both of the facts and the fictions she’s woven so deftly together. And yet despite these promises, for me this bestseller is all about the stylishness of its sentences – the plot itself, while engaging, lacks a satisfying resolution, and quite a few sections towards the end feel unnecessarily bleak. While individual scenes and characters kept me enthralled throughout, I found that after finishing the whole, I felt disappointed. Like the doll’s house itself, this is a book of great craftsmanship and beauty, but little lasting substance. 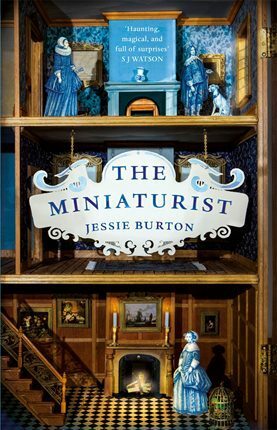 The Miniaturist by Jessie Burton is published by Picador and available to buy from Amazon. This entry was posted in Reviews and tagged book review, Jessie Burton, The Miniaturist by Judy. Bookmark the permalink.